There is always something special about "the good old days". 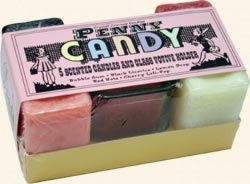 We have created this package of 5 square votives and a clear votive holder to re-create this simpler time. A time that was less hectic, when life seemed to move at a slower pace. These wonderful visuals noted by the colors, shapes and scents are all reminiscent of this greatly treasured period.